Pennsylvania officials say they’ve confirmed the state’s first fracking-related earthquakes took place last year in Lawrence County, northwest of Pittsburgh. As a result, the Department of Environmental Protection (DEP) is stepping up its requirements for drilling in that part of the state, which is known for seismic activity. In April 2016, Texas-based Hilcorp Energy Company was fracking a pair of wells in the Utica Shale near New Castle, Pennsylvania when seismic monitors nearby detected five tremors, measuring between 1.8 and 2.3 on the Richter scale. Quakes that small are too faint to be felt on the surface. But they were significant, if only because fracking-induced earthquakes had never been recorded in the state. 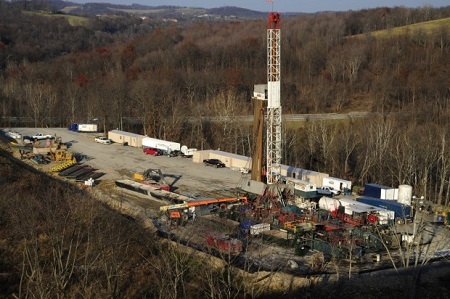 “At least within Pennsylvania, this is the first time that we have seen that sort of spatial and temporal correlation with [oil and gas] operator activity,” says Seth Pelepko, chief of well-plugging and subsurface activities for DEP’s oil and gas management program. Earthquakes in Pennsylvania are relatively uncommon, though oil and gas-related earthquakes have been observed in Ohio and Oklahoma. In those cases, fracking waste disposal — not the fracking process itself — is usually the cause. In Ohio, a study found that 77 small earthquakes were linked to natural gas drilling around Poland Township in 2014, just over the state line from Lawrence County. Hilcorp immediately shut down the well, known as the North Beaver NC Development well, when DEP alerted the company to the seismic activity. In a statement, company spokesman Justin Furnace said the company is reviewing the DEP’s report and has no immediate plans to resume work on the well. The DEP’s Seth Pelepko says the wells were drilled about 8,000 feet below the surface and were much closer to the region’s ‘basement’ rock than a typical shale gas well. “The greater the vertical separation between this basement rock and the [drilling] activity, the less likely that an induced event will occur,” Pelepko says. At the time of the quakes, Hilcorp was conducting a “zipper” fracture, a technique where two parallel, horizontal wells are fracked in tandem. Pelepko says this technique enlarges the pressure zone near the wells during hydraulic fracturing, stimulating the release of oil and gas by injecting millions of gallons of water, sand and chemicals into rock formations. Pelepko says pressure can also be a factor in inducing earthquakes. The DEP has told Hilcorp to stop zipper fractures at its wells in the areas of Mahoning, North Beaver and Union townships in Lawrence County, where the quakes were detected. More than 10,000 “unconventional” wells have been drilled in the Marcellus and Utica shales in Pennsylvania. The state is the second-largest producer of natural gas in the country, behind Texas. Note: This story is from the Allegheny Front, a public radio program covering energy and environmental issues in western Pennsylvania.